The 5’5″ GX-1 BLAK offers the professional pianist a superb range of tonal expressiveness and a level of elegance and craftsmanship that is unsurpassed for a piano of its size. Available Finishes: Polished Ebony, Satin Ebony, Polished Dark Walnut. The 5’11” GX-2 BLAK combines the stately presence of a classic grand with an exquisite clarity of tone unmatched by other pianos in its class. With a rich history of international acclaim, the GX-2 is the popular choice for homes, schools, churches and teaching studios. Available Finishes: Polished Ebony, Satin Ebony, Polished Snow White, Satin Oak, Satin Cherry, Polished Dark Mahogany, Satin Dark Mahogany, Polished Brown Sapeli Mahogany. 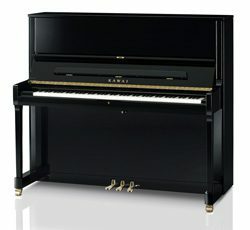 The 6’2″ GX-3 BLAK impresses with a dignified elegance and distinctive tone evoking the qualities of a much larger grand. With outstanding tone and touch in a versatile size, it is a preferred choice of professionals. Available Finishes: Polished Ebony, Satin Ebony. The 6’7″ GX-5 BLAK is the artist’s “grand for all seasons.” With resplendent tone and superb power, it adapts to an exceptional range of musical requirements and performance venues. The 7’0″ GX-6 BLAK combines exquisite tone with stunning beauty to offer an instrument befitting the finest concert hall or professional studio. At the lofty pinnacle of the GX BLAK Series, the regal 7’6″ GX-7 BLAK speaks with the transcendent character and authority that has made it the definitive choice of professional pianists. Available Finishes: Polished Ebony, Satin Ebony, Polished Snow White, Polished Mahogany, French Polished Mahogany. Available Finishes: Polished Ebony, Satin Ebony, Polished Snow White, Polished Brown Sapeli Mahogany. Available Finishes: Polished Ebony, Satin Ebony, Polished Brown Sapeli Mahogany, Satin Dark Walnut. With outstanding tone and touch in a 45″ frame, the K-200 offers the dependability and character needed to please any performing pianist from the novice to the seasoned professional. 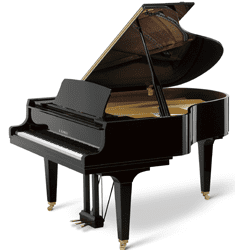 The AnyTime Hybrid – the piano you can play anytime and anywhere without disturbing anyone. Perfect for players who want the touch of an acoustic piano with the privacy of headphones. With outstanding tone and touch in a 45″ frame, the K-200 offers the dependability and character needed to please any performing pianist from the novice to the seasoned professional. 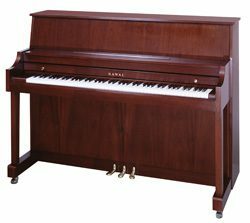 The 48″ K-300 builds upon the success of its award-winning predecessor, the K-3, that was named Acoustic Piano of the Year in four consecutive years. The K-300 proudly extends this distinguished legacy. 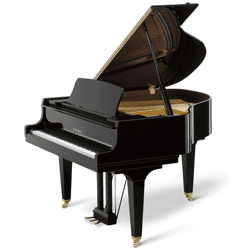 The AnyTime Hybrid – the piano you can play anytime and anywhere without disturbing anyone. 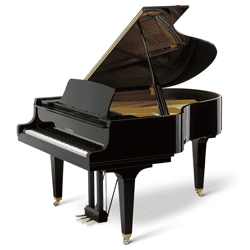 Perfect for players who want the touch of an acoustic piano with the privacy of headphones. 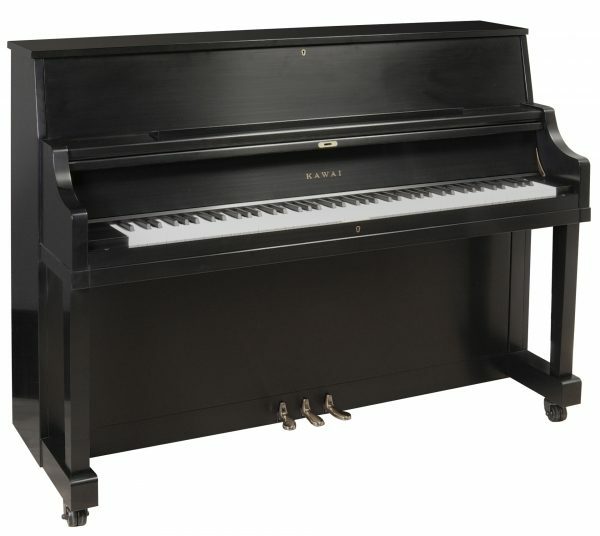 The 48″ K-300 builds upon the success of its award-winning predecessor, the K-3, that was named Acoustic Piano of the Year in four consecutive years. The K-300 proudly extends this distinguished legacy. 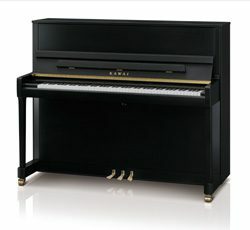 The uniquely practical 48″ K-400 features a grand-style music rack that places music at eye level and provides a solid surface for sheet music and oversized music books. A New England Style, dual-hinged fallboard adds to its distinctive appeal. The 44-1/2″ Kawai 506 was specially designed to meet the needs of those who require high quality and durability in an instrument… without a premium price tag. 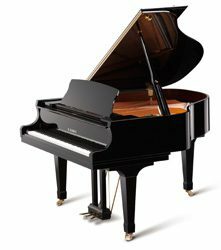 The 506 embodies three fundamental elements of a fine piano-an exceptional soundboard made of solid spruce, a durable back assembly with 5 sturdy back posts, and our exclusive Ultra-Responsive Direct Blow Action. 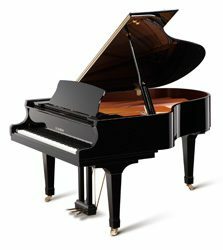 These important elements ensure a level of tone, touch and durability that will satisfy the needs of any pianist. Finally, we added a handsome cabinet with a sturdy “toe-block” design. The result is a finely crafted, superb-sounding instrument that will bring you satisfying musical enjoyment for many years to come. Available Finishes: Satin Mahogany, Satin Ebony. 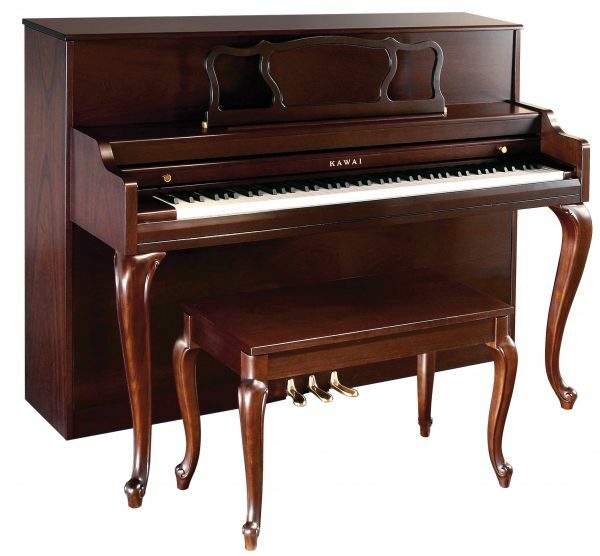 The 44-1/2″ Kawai 508 Decorator Console embodies three essential elements of a fine piano — a superior soundboard made of solid spruce, a durable back assembly with sturdy backposts, and our exclusive Ultra-Responsive Direct Blow Action. These important elements ensure a level of tone, touch and durability that will satisfy the needs of any pianist. 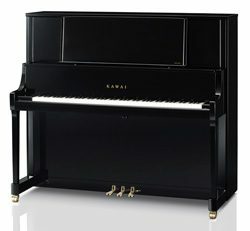 Add a stylish cabinet with attractive, elegant lines and the result is a finely-crafted, superb-sounding instrument that will provide satisfying musical enjoyment for years to come. 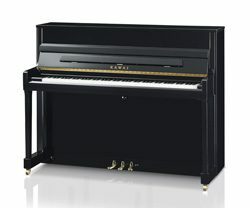 With its unmatched combination of durable construction and exceptional playability, the 46″ Kawai UST-9 outperforms every instrument in its class. Our master craftsmen designed it to exceed the most demanding institutional requirements. 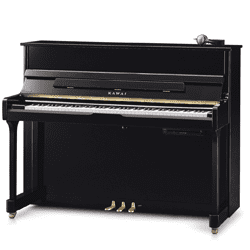 But the UST-9 goes far beyond every standard by offering the world’s most advanced upright piano action and design enhancements that set it apart from any other institutional piano. Experience the UST-9 and see why it is the ultimate blend of performance and durability. This piano features the Millennium III Action(tm) with Carbon Fiber, Sturdy Back Assembly for Stability, Angled Music Rack for Support, Reinforced Bench for Durability, Double Wheel Casters, Lid and Fallboard Locks. Available Finishes: Oak Satin, Walnut Satin, Cherry Satin, Satin Ebony.